The charter under which Furniture Row Racing fielded the No. 78 Toyota for Martin Truex Jr. has been sold to a new team formed by Spire Sports + Entertainment founder Jeff Dickerson and T.J. Puchyer. Furniture Row Racing shuttered operation at the end of the 2018 Monster Energy NASCAR Cup Series season and Truex has moved over to Joe Gibbs Racing for 2019. Charters guarantee race starting positions to teams that hold those charters. Also race results tied to charters are a determining factor in the percentage of purse money the holding team receives. The charter purchased from Furniture is the most valuable charter to hit the market since the implementation of NASCAR’s charter system in 2016, because the No. 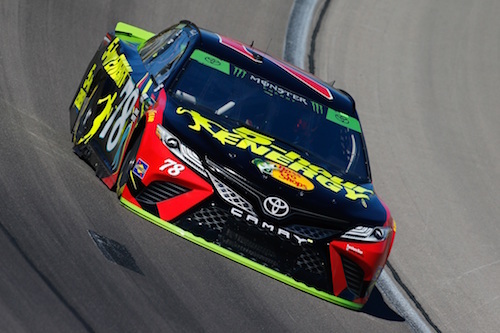 78 Furniture Row Racing team won the 2017 Monster Energy NASCAR Cup Series championship and finished second in the standings in 2018. According to an NBC Sports report, the price paid for the charter is the highest amount paid for a NASCAR charter, yet. Charter selling prices aren’t usually made public, but a charter was transferred from BK Racing to Front Row Motorsports for a price of $2.08 million earlier this year. That price became public as a result of its sale as a part of a bankruptcy court-mandated auction. The new race team will field a No. 77 Chevrolet. No driver or sponsor announcement has been made. Spire Sports + Entertainment is a sports management company that has NASCAR drivers such as Kyle Larson among its clientele. The company also works with NASCAR teams including Hendrick Motorsports and Chip Ganassi Racing.